Given the world we now live in, the need for RELIABLE offsite backup of mission critical business information is indisputable – for all businesses! So what’s the most cost-effective way for a small business to reliably backup their data? 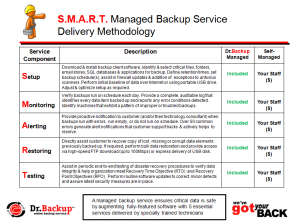 Although it may at first sound counter intuitive, a managed backup service (the type delivered by Dr.Backup) is likely to be LESS EXPENSIVE than self-managed backups many customers purchase today from the web. The reason is simple – economics. According to the Wall Street Journal in May 2015, the average wage in the U.S. was $24.96/hour. This number is JUST the salary – not fringe benefits or other employee costs. So how likely is it that an average employee could (or would) actually do the tasks required in just 5 minutes a day — accurately and reliably? Dr.Backup has a team of backup specialists and sophisticated monitoring and management tools that help us to efficiently manage the backups of 1000’s of devices each night. Our average client pays between $1 and $2/day for this professional service. So, when an organization opts for a self-managed solution, they are actually buying a more EXPENSIVE solution. This is because of the failure to take into account the human level of effort required to run a reliable backup and disaster recovery process for their organization. A single call to Dr.Backup can help the savvy small business person to get reliable and cost-effective backups every day!